Congratulations to Becky Hulsey of our Blue Ridge store. Last week she became an FFF Certified Casting Instructor. The Federation of Fly Fishers administers the Certified Casting Instructor program to educate and enhance the growth of fly casting instructors and is widely recognized as the ultimate professional certification in casting instruction. 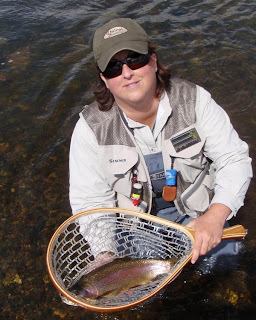 Becky joins other Unicoi Outfitters guides David Hulsey, Becky Strain, Joel Dickey, Dave Humphrey, and Chase Pritchett as Certified Casting Instructors and Rex Gudgel as a Certified Master Casting Instructor. Becky and David have also completed the Instructors Course at the Wulff School of Fly Fishing. Unicoi Outfitters is proud to have some of the most qualified instructors anywhere.